You have just decided to quit your job, and you need to write a respectable resignation letter? 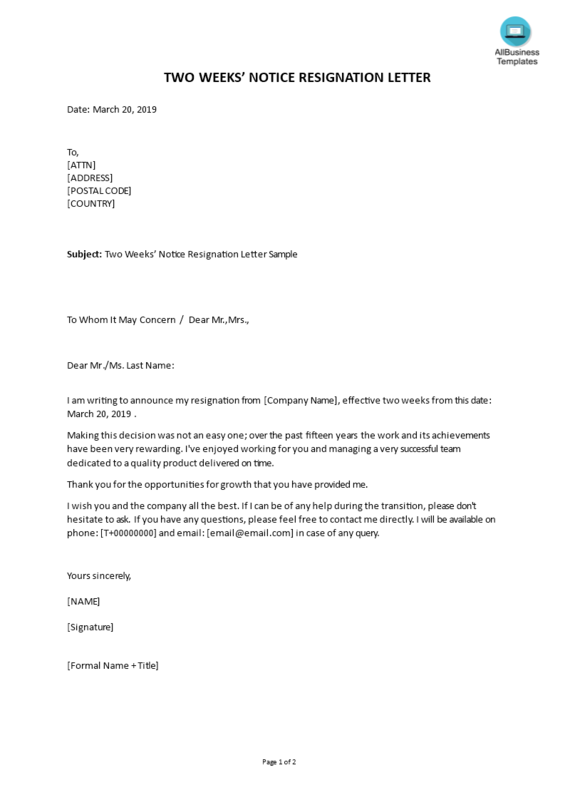 Download Letter Of Resignation Template that includes a two weeks' notice period now! A resignation letter is a, generally very short and formal, letter that is informing your boss or employer that you are quitting your job. By writing a resignation letter, you can help maintain a positive impression of yourself and keep a good relationship with your old employer by leaving with a strong and positive final impression, while also paving the way for you to move on. When you are drafting a letter of resignation, you need to announce the resignation from the organization and mention the legally applicable notice period, including from which date it starts to count. Whatever the circumstances of your departure, this Letter of Resignation Sample can help you draft a polite and appropriate resignation letter. In general, a resignation letter should be a short letter, formally exhorting your boss that you are leaving your job and the company. Such an abdication letter can help you keep up a positive association with your company and boss by leaving with a solid and positive last impression, while likewise preparing for you to proceed onward. Please consider it might cause some stress for the employer who needs to find a replacement. Therefore it's important to give the notice in time (especially check with your contract), with for example two or four weeks, which is often an accepted minimum period of time. Therefore it's good to emphasize that it was not an easy decision to make, and that you had a great time at the employer; that it has been very rewarding. So you need a professional template 2 Weeks Notice Resignation now! In order to rapidly manifest your needs, you need to get clear on paper exactly what it is that you want. Our template will help you structure your thoughts on every detail in a professional way! Our Templates are helping you to reach the next level of success in your career. Download this 2 Weeks Notice Resignation template and after downloading you can change and customize every detail and appearance and finish it in minutes. Fast, safe and easy! How to write a Resignation letter? If you are asking yourself this question, you must be ready to resign from your job. We provide the best professional, formal and basic letter of resignation templates for you.